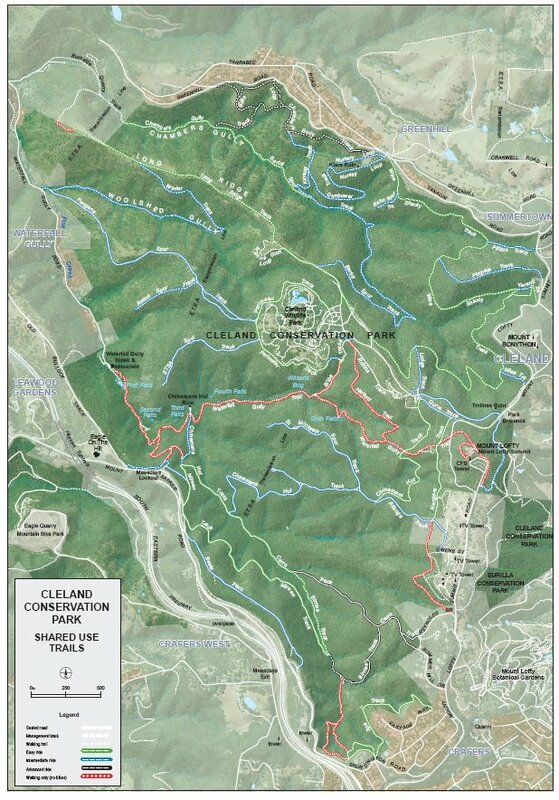 The shared use trails in Cleland CP are vehicle tracks and 4WD tracks, there is no single track in Cleland. The trail map shows green, blue and black trails but these are still vehicle tracks and 4WD tracks, not single track. Parking waterfall gully car park can be a problem on weekends, just ride there instead. Park information also available from DEWNR web site Cleland Conservation Park. All trail heads have map boards and signage of the trails. Drinking Water: Yes, drinking water is available in some locations but it is not shown on the map. Toilet facilities: Yes, toilet facilities are available in some locations but are not shown on the map. Car Parking: Yes, there is parking at the end of Waterfall Gully road which is at the bottom the park, however this area can be quite congested so avoid parking here if possible. There is parking at the Wildlife Park in the center of the park, however the gates area closed after hours. There is parking at Mt Lofty Summit at the top of the park. The Waterfall Gully Rd entrance to Cleland Conservation Park is located 9km south east of Adelaide city center. If coming from the city the easiest way to access the park is from Waterfall Gully Rd, however car parking availability can be limited on weekends. Train transport: There is no train transport to Cleland Conservation Park. Cleland Conservation Park is in the Mt Lofty Ranges Fire ban district. Web site: Refer DEWNR web site Cleland Conservation Park.